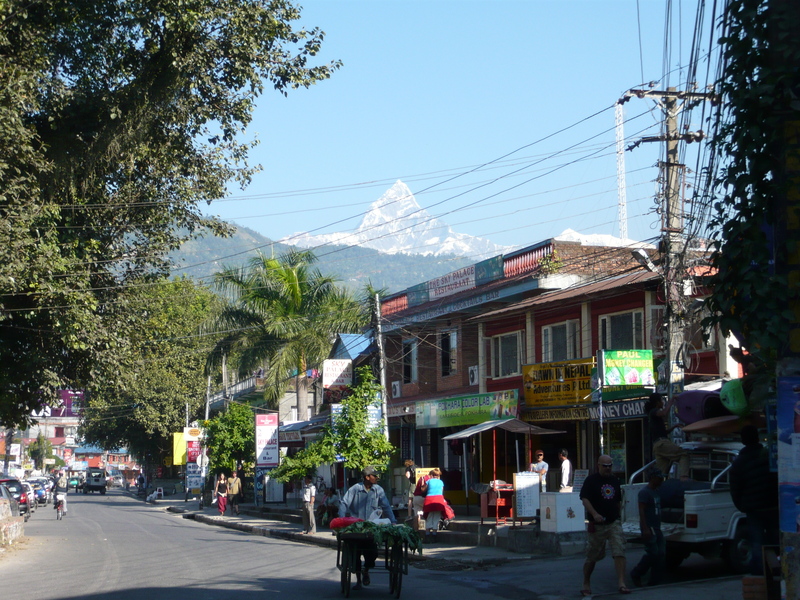 We arrived in Pokhara to yet another brilliant blue, cloudless sky and the return of warm, t-shirt weather. After twelve days in the mountains, it sure felt good to be back in civilization, comfort and warmth. 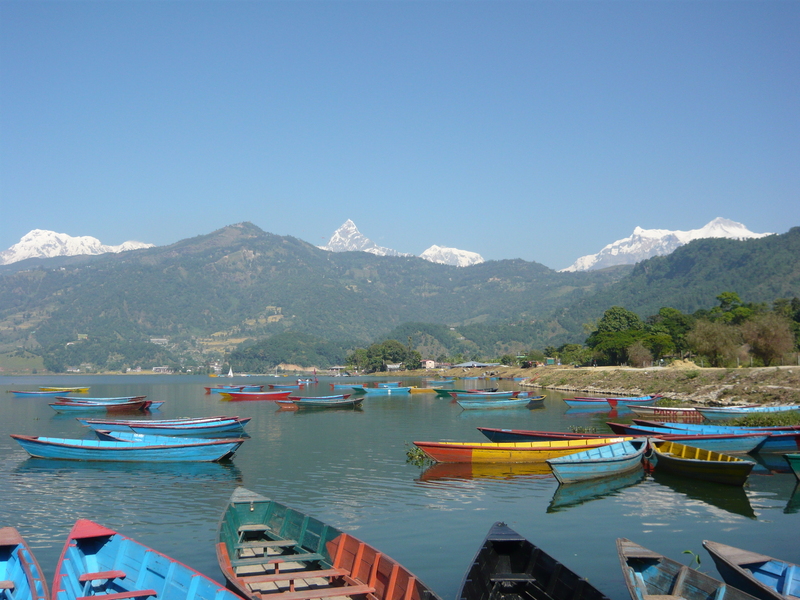 Pokhara is a tourist hub for those who want to see the mountains but not trek them. 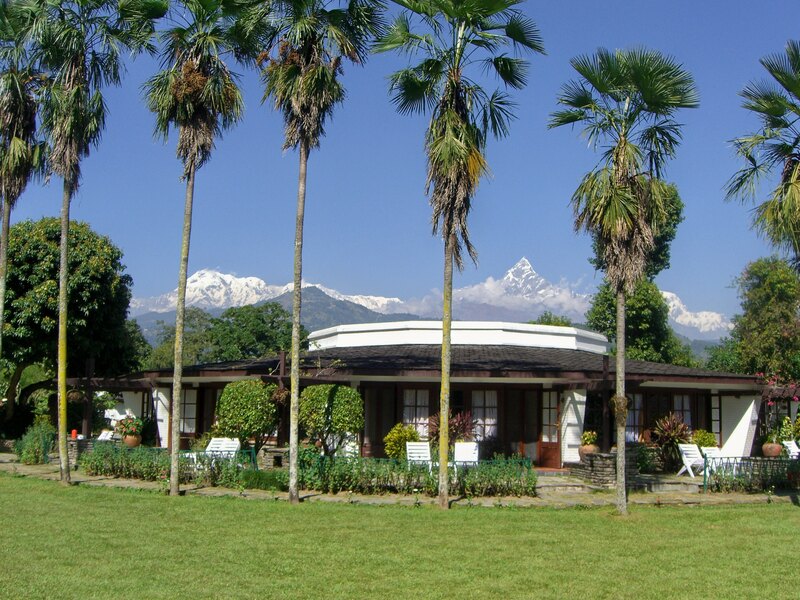 It offers incredible views of the Annapurna range at its finest, shopping, restaurants, and adventure thrilling sports like tandem paragliding, whitewater rafting and microlight flying. We reached our hotel and it felt like luxury. For $60 a night, you had a huge room, your own shower and bathroom (finally! 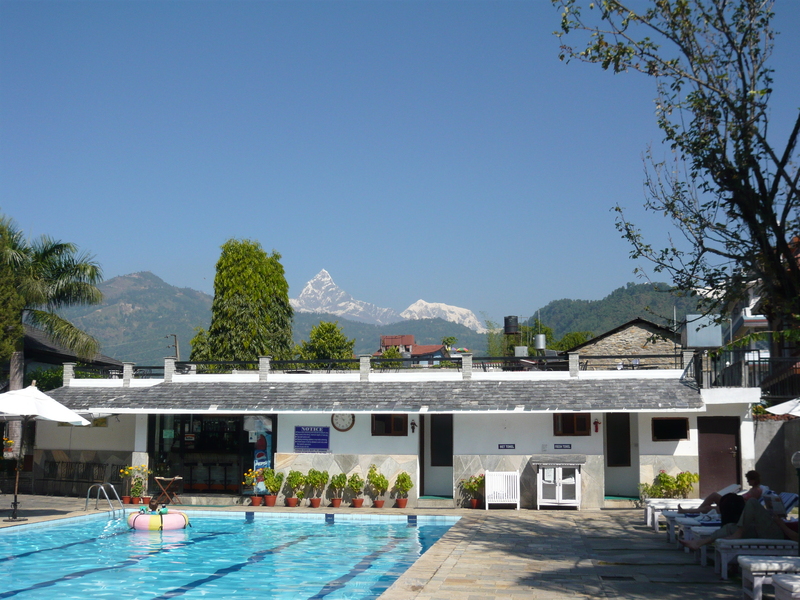 ), a gorgeous pool, and a guilt-ridden buffet breakfast. After twelve days without real heat, plumbing, and sometimes even electricity, this felt like heaven. The first order of business for the day involved shopping. Not for us, at least not right away. For our porter, Chhring. As promised on the trek, we were going to buy Chhring his first real pair of hiking boots. He had gotten by the entire time with a load of 60 pounds wearing sneakers and we felt this was not acceptable. 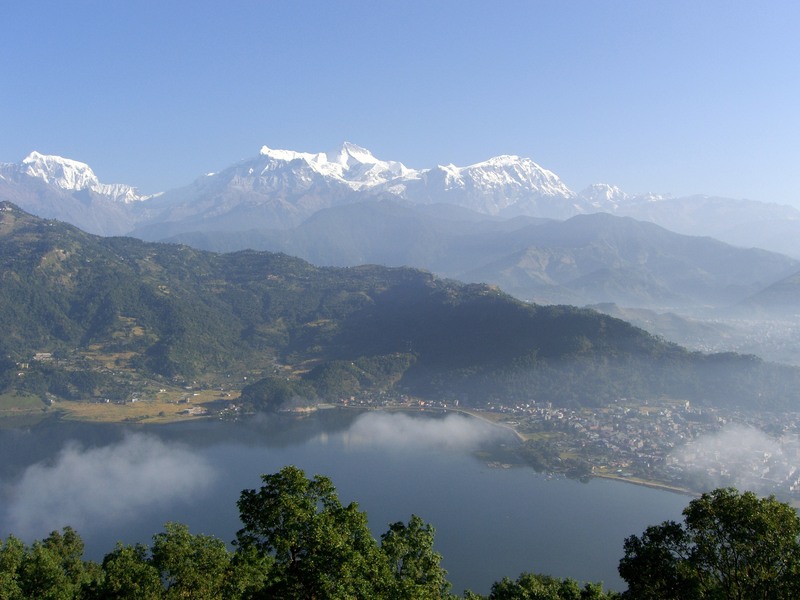 A good pair of hiking boots in Nepal can run $100 which can be two months’ salary for most Nepalese. Therefore, most porters and guides simply can’t afford them. The plan was for Hari and Chhring to shop around for an hour, checking out each sporting goods shop for the best selection and prices. Once they had negotiated and haggled a good deal, we would meet them at the hotel, go back to the store and pay. If we went with them, they would never be able to bargain down the price. An hour and a half later, we met at the hotel and walked together to the shop to purchase the boots. Chhring’s proud smile meant more than the repeated “thank you’s” that he gave. We knew we did the right thing. The rest of the morning was spent shopping for friends and family at home. 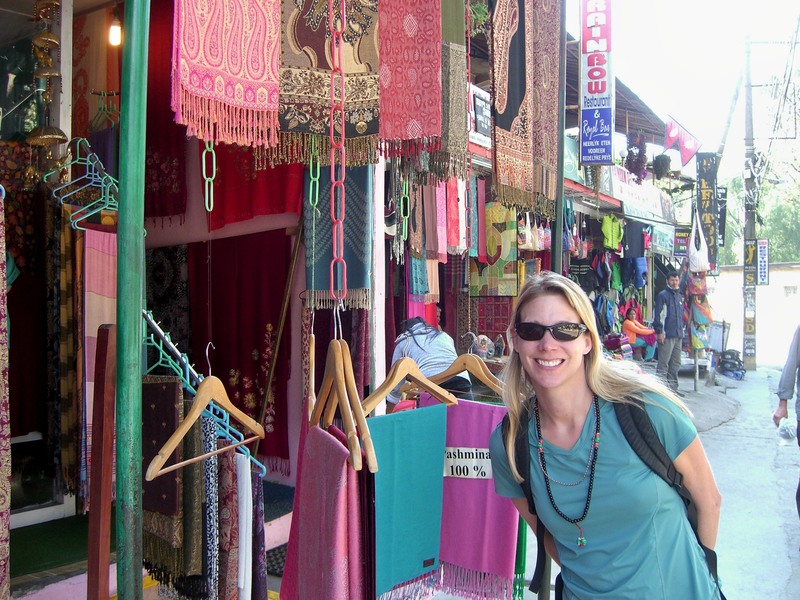 Pokhara has several shops with beautiful hand-made pashmini scarves, Kashmir sweaters, artwork and other nice gifts. The prices are very reasonable, especially for our standards so we did our share helping support the local economy. The food was also surprisingly delicious and we splurged on lunch enjoying things we haven’t eaten in weeks. 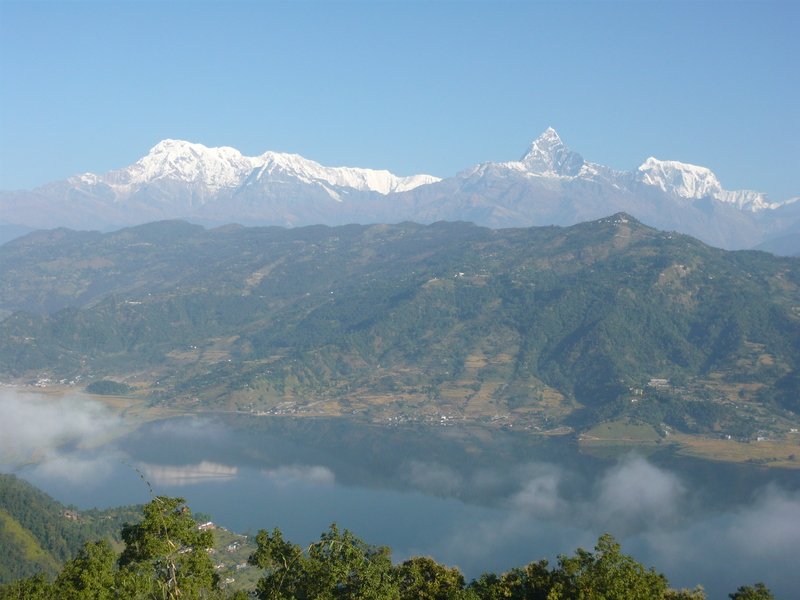 However, the real reason why Pokhara was going to be magical was due to the timing of our arrival. 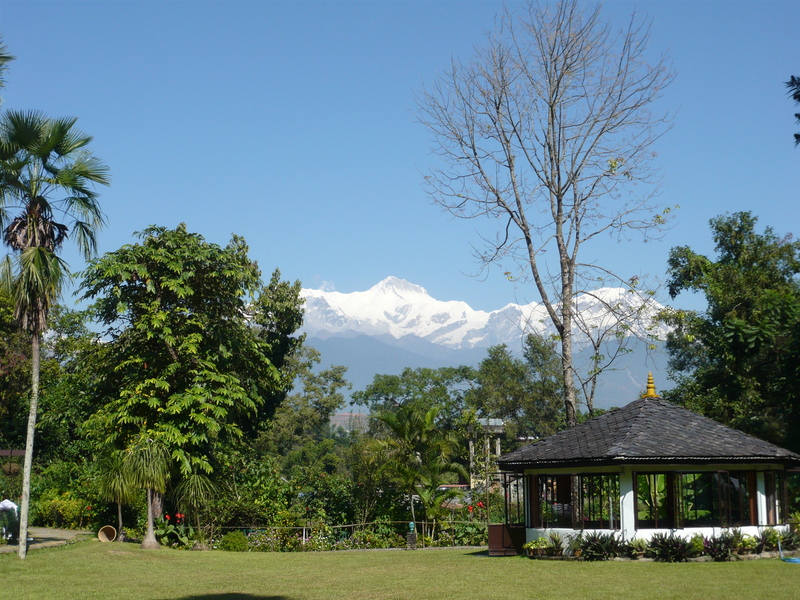 We just so happened to arrive on the third day of Tihar, or The Festival of Lights, a five-day long celebration that is one of the most significant Hindu festivals in Nepal and India (known as Diwali in India). 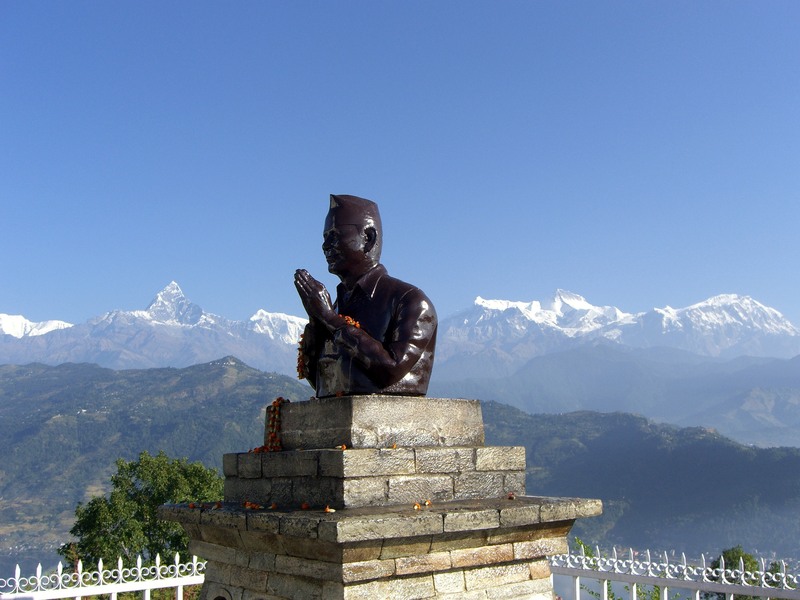 Tihar occurs either in late October and early November and is celebrated all throughout Nepal and India by both Hindus and non-Hindus. It is a five-day festival that worships certain animals (the crow, dog and cow) as well as the Hindu Goddess of Fortune or Wealth (Goddess Laxmi). 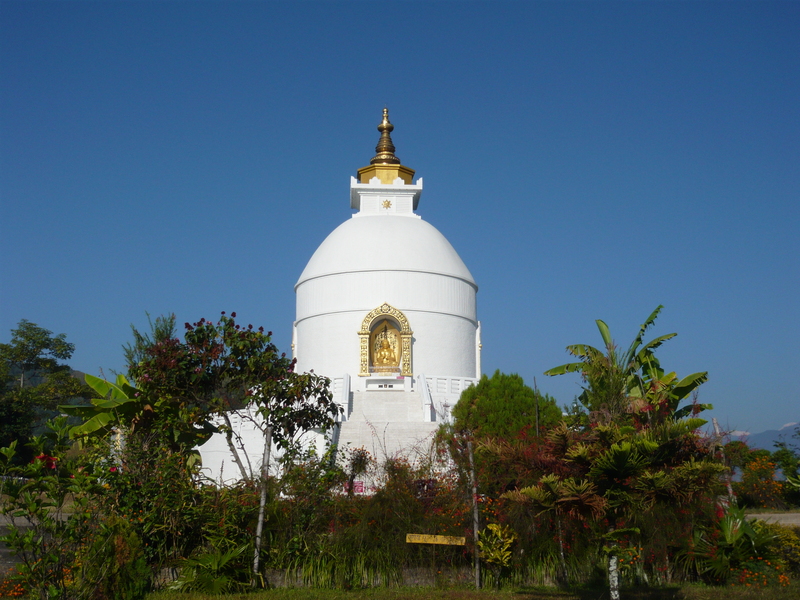 (For a more in-depth explanation of the festival and activities each day, see: http://www.nepalvista.com/travel/tihar.html). The highlight of the festival occurs on the third day known as “Deepawali” which means the “decoration of light.” Every household in Nepal is light up inside and outside with bright candles or clay oil lamps making it a magical, beautiful time of year. The sidewalks are also lined with rows of finger-length lit candles. It is an absolutely spectacular site! Hotels, restaurants, shops and homes are also decorated in strings of bright orange marigolds and you can also find colorful artwork and designs made of rice placed beautifully along the floors of hotel lobbies, shops and sidewalks. The entire day is a party as most people get the day off and there is no school for the children. 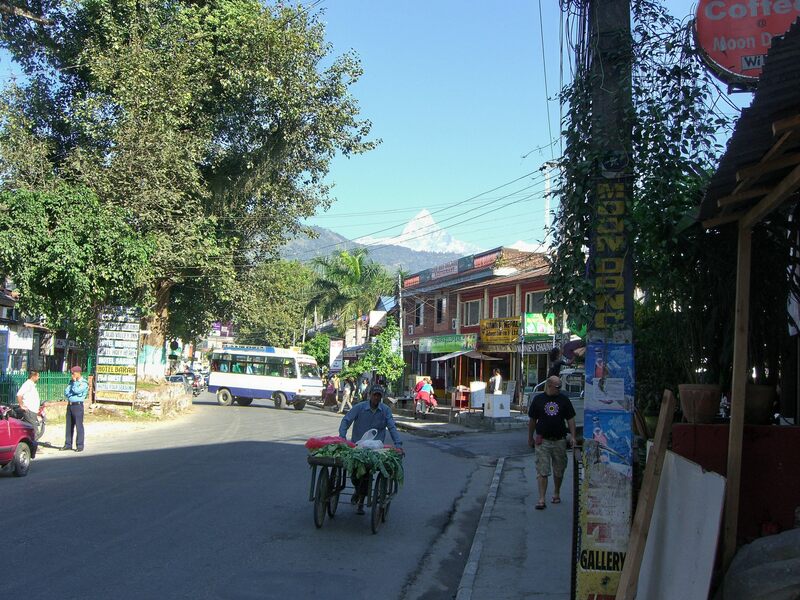 Throughout the day and long into the nights, bands of children and young adults move around town dressed in their best saris or clothes, singing and dancing traditional Nepali music or plain-old rock and roll, and then collecting change at the end that they pocket and (hopefully) use for their education. You can plant yourself at a bar or on a street corner for hours and watch group after group of performers entertain. It is quite an unforgettable experience and it makes you feel so alive. Like you are part of a bigger thing. A perfect day was followed by a perfect evening. We had told Hari and Chhring to pick any place they wanted for dinner: Steak, Italian, Nepalese, etc. We would treat. To our surprise, they picked Nepalese (and they even ate Dal Bhat again, the National Food that Nepalese eat every day for lunch and dinner). 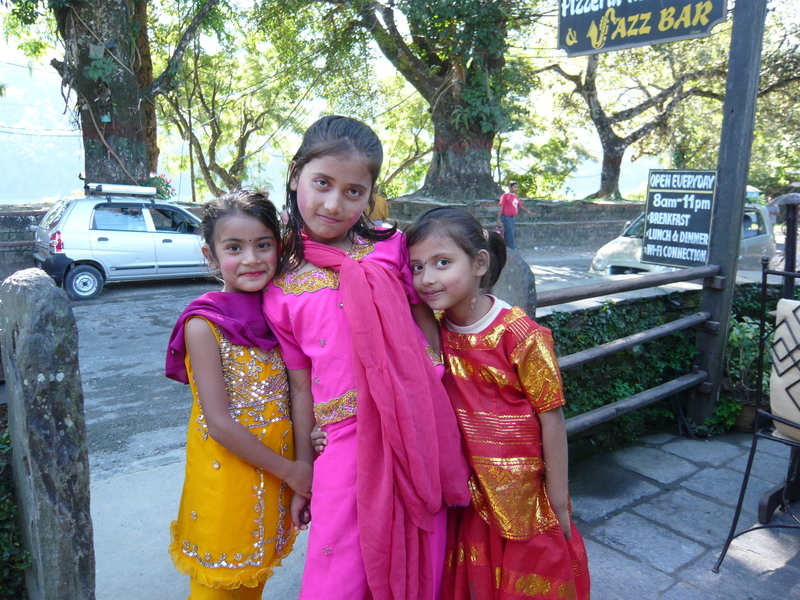 Hari and Chhring wanted to bring us to see a Nepali Culture Show. We dined outside, under the Festival of Lights, and were entertained by over 20 different songs and dances, each from a different culture and tradition. It was fascinating! 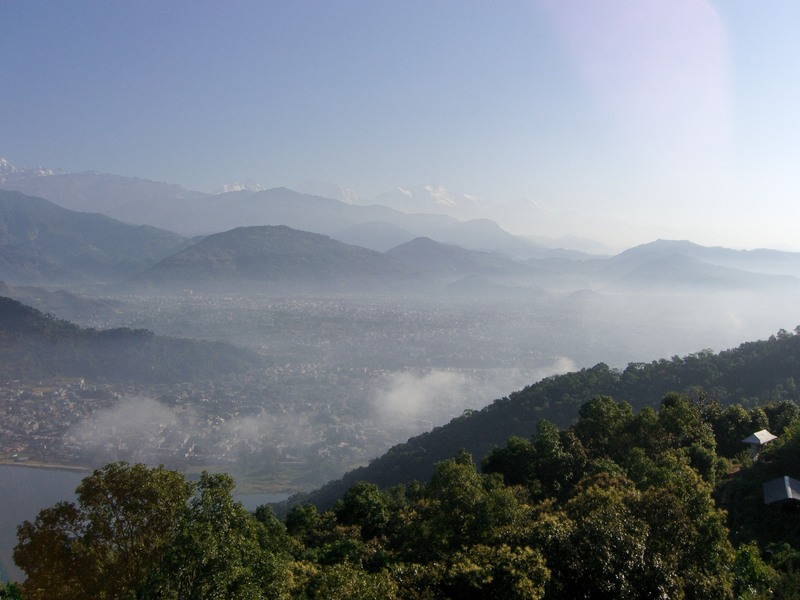 Nepal is surprisingly diverse and has a rich culture, boasting over 100 different languages. The highlight of the performance happens at the end. Just as you are ready to stand up and clap, the dancers come off stage and grab the guests in the audience to dance with them on stage. So before you know it, you are on stage dancing to Nepali music as best as you can, smiling, laughing and having a great time! What a night to remember! Thank you! I have just a few more entries to make and photos to share. Nepal has definitely been one of the best places I’ve ever been. Life-changing place and it makes me hungry to see more of the world. That is what travel is about, isn’t it? Never stopping! Hope you make it to Nepal soon and if you like to hike, trekking is by far the best way to see it and interact with the local culture! That’s exactly what traveling is all about. I’m glad I found somebody else with the same views about it as me. I am 100% all about hiking. When I was in Patagonia I was actually there for a 2 week trekking trip through the mountains. My lifelong goal is to climb Everest one day (or at least attempt), although the price tag is a bit insane, but trekking through the foothills of the Himalayas would be a dream come true.